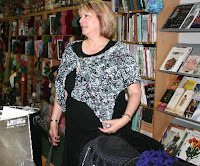 Yarn and Fiber Happenings: And Let the Lacing Begin! and the Artfelt! and the Cubby Filling! And Let the Lacing Begin! and the Artfelt! and the Cubby Filling! The Addi Lace Needles have arrived! We have many sizes available ranging from US#1-24" to US#6 - 47". These are a joy! We are finding that many of customers who try the Addi needles never go back - they are wonderful! 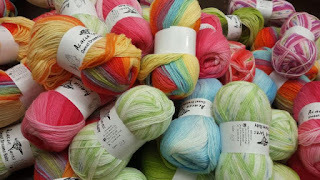 Oh the Artfelt is here! Artfelt is revolutionizing the way we felt! This technique, using a combination of fine merino wool roving from Zitron and a magical easyfelt paper, is exclusively offered in the US and Canada by Skacel. Artfelt is a combination of needle felting, wet felting and fulling. It requires far less time and talent than any of the three! Artfelt allows one to make felted pieces that are as thin as paper as well as thick enough for a handbag, all while allowing for precision detailing of design. Any felted piece the imagination can conceive, artfelt can achieve!. Artfelt is the new centerpiece of the Artfelt line by Zitron. Artfelt is a new hand-dyed 100% merino roving, boasting a rating of 19 on the micron scale. Butter soft, durable and colorfully intoxicating, Zitrons roving is available in Pencil roving (40m/50g). There are currently 11 multicolored hues to choose from. We have previewed Artfelt is on our website and if you wish you can order your favorite color. We can either place it aside for you for pickup or you can have us ship it to you... remember we always offer free shipping in the US and Canada. But until then, we will be filling cubbies.... fifty new cubbies have found their new home in our shop! Fun, fun, fun!!!!!!! Gnuman the Gnome Crashes our Knitting Class! Can a Person Have Too Much Noro?